Transparent fleece and other floating films, known collectively as crop covers, are laid over or around plants hastening their growth, and protecting against weather and pests. They are usually used without supporting hoops. Fabric-like plastic sheeting, sold as sheets cut to measure, as rolls or cut from the roll, are widely used in gardens and commercial undertakings to cover plants. These materials provide a small but significant amount of protection from cold or windy weather, and also often very effectively exclude pests. Originally thin, light, transparent polythene sheets (perforated to allow excess heat and humidity to escape) were used but issues with over-heating and lack of insulation at night has led largely to its replacement by a non-woven (technically called spun bonded) polypropylene ‘fleece’, sometimes referred to as horticultural fleece. Fleece is white, extremely light and soft and warm to touch. For this reason it is often used to wrap slightly tender plants against winter weather. Its porosity makes it much less prone to over-heating and wet conditions than polythene covers. Crop covers are the modern equivalent of cloches formerly widely used in gardens and even market gardens. Crop covers work by warmth from the sun raising temperatures by a few degree, typically 2°C, compared to uncovered plants. This can advance maturity or flowering by about two weeks. Spring: Covered tender plants can be sown or planted out earlier than if uncovered by about two weeks in spring. Crucially crop covers prevent overheating by allowing heat to escape through holes built into them during manufacture. Unpierced transparent polythene sheeting or bubblewrap, for example, would not only lead to excess moisture but damage plants by excess heat on sunny days even in mid-spring. Late summer and autumn: In late summer and autumn crop covers can allow tender crops such as cucumbers and bush tomatoes to ripen. Autumn sowings can be protected over winter to allow earlier crops than spring sowing; carrots and chard for example. Winter: Fleece is often used to insulate plants against winter cold. In fact without heat from the sun (solar gain) the temperature around covered plants will fall quite quickly to the ambient temperature. However, fleece does protect from other aspects of harsh weather – wind and hail, for example – and is often used in conjunction with straw and similar materials where the combined effect of fleece and insulation is very effective. Different grades of crop cover give different levels of warmth and protection; light fleece (17g per sq m) for instance, gives less protection but better light penetration (and is cheaper) than heavy duty fleece (35g per sq m). The latter might be used to protect tender plants and the former to advance young crops of seedlings. Wind often retards growth of plants in British gardens as much as temperature. Crop covers, if well anchored, enhance growth rates by avoiding stress from wind (mechanical stress and water loss). Crop covers offer some protection against the small hailstones generally encountered in Britain. Crop covers break the impact of heavy rain and protect the soil to some extent from mechanical damage that can lead to significant surface compaction limiting seed emergence and growth of young plants. Used as a physical barrier, crop covers can be highly effective in excluding pests. Insect-proof meshes are a variant of crop covers that give protection against insects often without significant increases in temperature but good protection against wind and hail. Raised humidity levels and subsequent soft, lush growth produced when growing under crop covers encourages diseases such as Botrytis and downy mildew. The accompanying higher temperatures and abundance of lush foliage also create an ideal environment for many pests when the crops are finally uncovered. Conditions ideal for crop growth are also ideal for weed growth. Transplants are likely to out-grow germinating weed seedlings, but direct-sown crops may have competition. 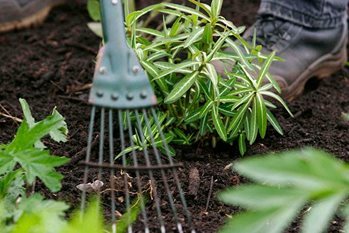 Unfortunately, it is usually necessary to uncover plants every two to three weeks to hoe, weed and also thinning of seed sown plants. Insect-pollinated crops such as strawberries and courgettes are unsuited to growing under crop covers during their flowering period. Crop covers have a short useful life and cannot be easily re-used or recycled. Robust covers with a long useful life should be the first choice. Fleece: Polypropylene fleece (horticultural fleece or 'fleece') can be used for tunnel cloches and floating films. These trap good warmth, are inexpensive, allow rain and pesticide sprays through and, being porous, allow excess heat and humidity to escape. They are especially useful for covering seeds, transplants and rooted cuttings. Fleece-covered crops can be harvested 2 weeks ahead of crops in the open. Unlike polythene, fleece can be left on all summer (to exclude pests, for example). Fleece can also be double-layered for extra frost protection, and can be used beneath glass or plastic cloches and in cold frames and greenhouses for extra insulation. Fleece is not durable and 17g fleece is usually replaced annually although 35g fleece can give more than one season’s use. Fleece is very vulnerable to fox damage. Woven meshes: Woven polythene covers such as Envirotect are durable and resist foxes to a considerable extent. Perforated or ‘aerated’ polythene: Clear polythene with numerous holes cut into the sheet were the first crop cover but provided pest protection. Temperatures and humidly can also rise to damaging levels from late spring, but on the other hand they capture more warmth and prompt more growth in early to mid-spring.